I have absolutely no idea how PopCap Games does it. Every single game to come out from the company in the past year or two has been one of the most addicting shareware titles for the PC, no matter how crazy the concept may sound. 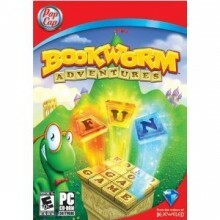 The same can be said of Bookworm Adventures Deluxe. As bizarre as it may sound, Bookworm Adventures takes the established Bookworm formula (which involves forming words out of letter tiles) and turns it into a story based adventure. The amazing part is that this formula turns out to be just as addictive as the rest of the PopCap collection, making it another shareware title that’s devilishly distracting. The Adventure mode is where players will spend the majority of their time. This mode sees players guide Lex the Bookworm through a variety of different worlds in his mission to defeat evil. In order to attack enemies and progress, players must make words out of the letter tiles. The bigger the word, the more damage Lex’s attack will do. In addition to that there are treasures and items that can be used to increase health, reduce damage, and even poison the enemy. Enemies each have a variety of different attacks, and even have the ability to damage letter tiles and lessen their effect. You can tell that PopCap really thought of everything, as the gameplay feels nearly perfect. By delving deeper and deeper into the Adventure mode, players will unlock various mini-games and the Arena mode.The Arena mode is a much faster paced affair, and is a fun diversion after you’re sick of the Adventure mode. Mini-games can be played either within the main quest as a way to earn extra items or just at the player’s leisure, and feature games such as guessing a specific word within five turns. It’s practically absurd how much replay value is packed into this application, as you could play it for months without running out of things to do. As one would expect, Bookworm Adventures Deluxe has the graphical appeal and high production values that all PopCap titles have. The overall look of the game is often bright and colorful, allowing the title to appeal to a wide audience. Everything about this title (from the loading screen to the game itself) is extremely polished and looks great. In addition to this, PopCap has added a good deal of humorous dialogue which helps to keep the game fresh throughout. There may be no music in the game and little other sound other than effects (which are decent), but this isn’t that big of a deal. PopCap has once again produced another game capable of taking hours upon hours of your free time away from you. But this one actually has somewhat of an educational twist to it, as it encourages players to increase their vocabulary in order to defeat bigger creatures as the game progresses. Although on paper the concept behind this title may sound a bit unusual, give it a go. You’ll be surprised at how quickly this game can stink away your free time, and that in itself is proof of yet another hit for PopCap Games.